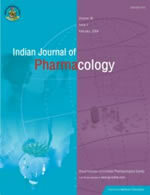 The Indian Journal of Pharmacology is an official organ of the Indian Pharmacological Society. The first issue of the journal came out in 1969 and it was published quarterly. In 1997 it became a bimonthly publication.